W. M. Keck Observatory takes its responsibility for good stewardship of Maunakea very seriously. That’s why we are deeply committed to full transparency for our staff and our community as we work to understand how, why, and to what extent a small amount of hydraulic fluid has been seeping from the hydraulic bearing system at our Maunakea facility. We confirmed the presence of hydraulic fluid in the cinder directly beneath the telescope on June 4, 2018, and immediately reported it to the Hawaii Department of Health, cooperating fully with all appropriate authorities, including the Department of Health, the Department of Land and Natural Resources and the Office of Maunakea Management. We launched an investigation, with the guidance of third-party environmental consultants Masa Fujioka and Associates. On this page is an archive of the updates we posted as our investigation and response plan progressed. We are ready to answer any questions you may have, so please contact Mari-Ela Chock at mchock@keck.hawaii.edu. 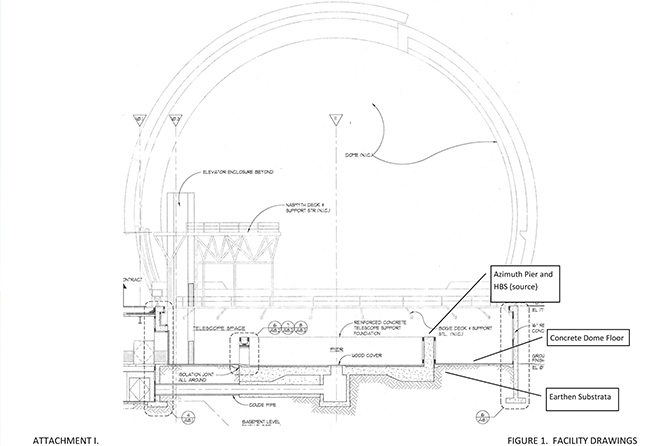 Facility drawing with details of Keck I pier design. 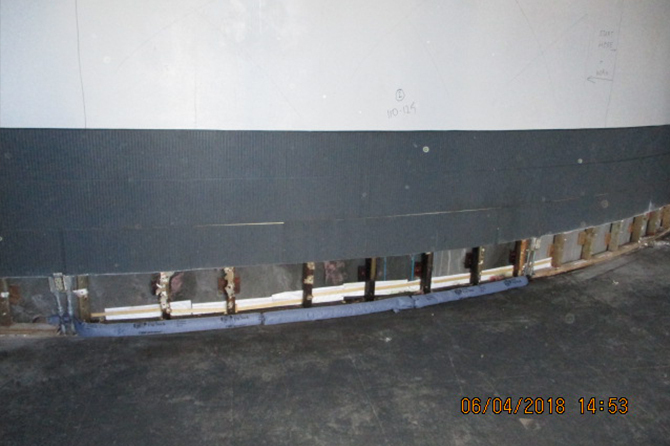 Close-up of pier wall with drywall removed. White absorbent pads to capture any seeping hydraulic fluid are visible at the bottom of the frame. Pier wall with drywall removed. White absorbent pads and blue absorbent mats to capture any seeping hydraulic fluid are visible at the bottom of the frame. Full transparency and responsible management have been – and continue to be – W. M. Keck Observatory’s top priorities throughout our investigation into the relatively small leaks of hydraulic fluid at our Maunakea facility, discovered in April 2018 and subsequently fully contained to prevent further release into the ground below. Our investigation concluded last year after a full report prepared by third-party environmental, geotechnical and hydrogeological consulting and engineering firm Masa Fujioka and Associates (MFA) on Keck Observatory’s behalf was submitted to the Hawaii State Department of Health (HDOH) in November 2018, per HDOH regulations. The report – an Environmental Hazard Evaluation (EHE) and Environmental Hazard Management Plan (EHMP) – has since been updated. One of the revisions made in consultation with experts at the HDOH addresses the magnitude of contamination. We have updated the initial calculation of an assumed oil saturation rate of the subsurface to 10 percent. This brings the total conservative estimated volume of impacted cinder to 7.0 cubic meters at most. The true quantity of impacted cinder could not be conclusively determined because the duration of the release is unknown due to drywall concealing the seepage. Without an exact start date for the seepage, a total quantity is difficult to estimate. However, a quantity is needed to determine what regulatory action to take. As such, Keck Observatory calculated the total release based on the current leak rate and an unlikely scenario that the leak began when the hydraulic bearing system was first installed nearly three decades ago. The other revisions made to the report provide greater detail on monitoring and inspections. The updated EHE/EHMP report, submitted to HDOH on March 18, 2019, is public record and can be found by using HDOH Release ID 20180604-1530. Keck Observatory’s investigation into the relatively small leaks of hydraulic fluid at its Maunakea facility has now concluded. Per HDOH regulations, a full report, prepared by third-party environmental, geotechnical and hydrogeological consulting and engineering firm Masa Fujioka and Associates (MFA), was submitted to the HDOH on Friday, November 9, 2018. The estimated leak rate of hydraulic fluid at the time of discovery was 0.46 gallons/month. 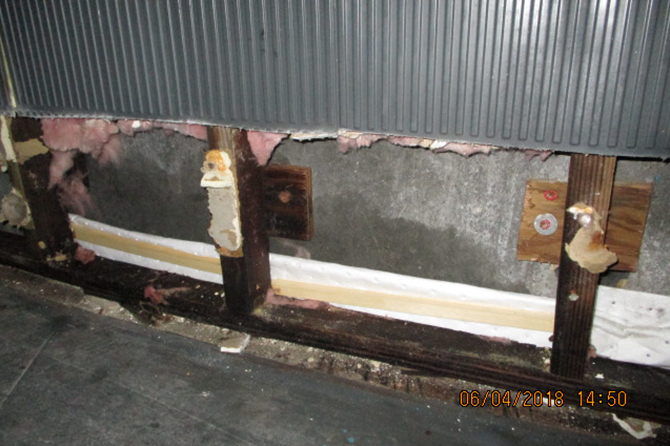 The duration of the leak could not be definitively determined because the evidence of the leak was hidden behind drywall prior to maintenance work conducted in April 2018. Without a start date for the seepage, the total quantity is difficult to estimate. As the site exists today, there are no direct exposure pathways. The affected cinder is under an enclosed dome, completely covered by the building’s concrete floor. This ‘cap’ prevents rainwater from interacting with and spreading the hydraulic fluid. No people, animals, or plants can be exposed to and impacted by the fluid. Furthermore, there is no groundwater in the vicinity. According to the report, electrical resistivity studies show that groundwater is several thousand feet below Keck Observatory’s Maunakea facility. Also, there is no surface water at the site. Thus, MFA finds that neither groundwater nor surface water are likely to be impacted. The hydraulic fluid is clean, has low toxicity, and is non-volatile. The release consists of clean Mobil SHC 525 hydraulic fluid that has not been mixed with any other fluids. Thus, its composition can be determined via the product’s Safety Data Sheet, which shows the fluid does not contain PCBs (polychlorinated biphenyls) and has minimal toxicity. Because it has not been subjected to high heat or combustion, the hydraulic fluid is non-volatile. As such, the fluid does not create an inhalation or vapor hazard. The recommended action is to manage in place. When it comes time for decommissioning and site restoration, an Environmental Hazard Management Plan (EHMP) will be implemented to mitigate potential future hazards of the impacted cinder. 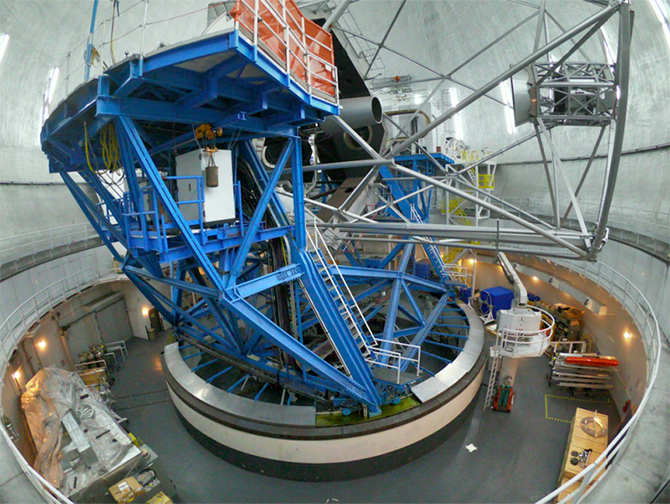 Having submitted the final report, Keck Observatory awaits final determination and direction from the HDOH. The release is now permanently contained. On Friday, September 28, Sakoda Construction, a general contractor based in Hilo hired by W. M. Keck Observatory, re-sealed the one-inch wide gap between the pier supporting the Keck I telescope and the building’s floor. This gap was identified during the Observatory’s investigation as the pathway through which hydraulic fluid seeped out of the hydraulic bearing system and traveled to the ground below. Sakoda Construction applied a polysulfide liquid that hardens to a rubber-like consistency into the gap. Prior to installation, Keck Observatory engineers tested the effectiveness of the sealant, which proved to be a successful barrier to the hydraulic fluid; it is the same kind of material used to seal swimming pools. With the installation of the sealant, there is no longer a path for hydraulic fluid, or any other substances, to release into the environment. 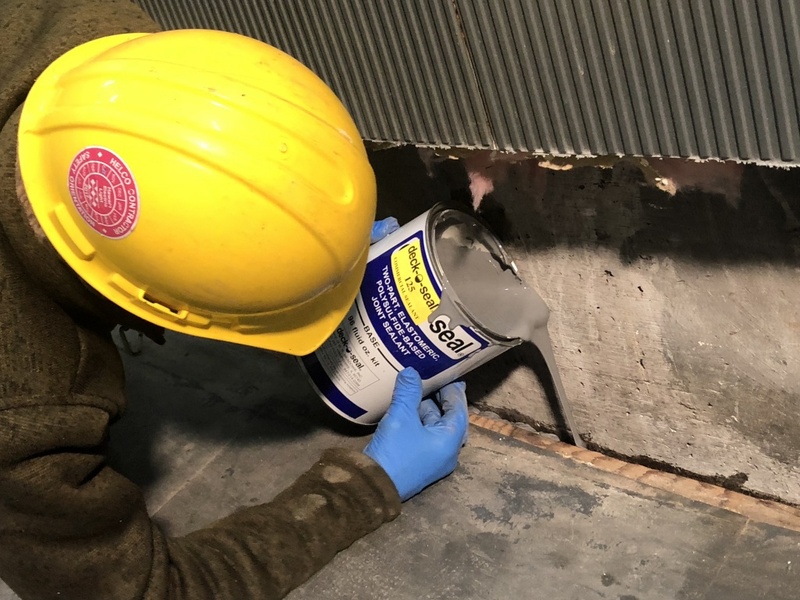 Sakoda Construction permanently contained the release by applying an impermeable sealant to a narrow gap between the pier wall and the floor of the Keck I telescope dome. On September 5, representatives of the Hawaii State Department of Health (HDOH), Hazard Evaluation and Emergency Response Office (HEER), and Office of Maunakea Management (OMKM) visited the summit to assess the situation and provide additional guidance and recommendations for preparation of the Environmental Hazard Evaluation (EHE) and Environmental Hazard Management Plan (EHMP). Interim containment of the hydraulic fluid remains in place to prevent further release into the environment. We are in the process of implementing permanent containment measures to ensure this doesn’t happen again. The HDOH has requested additional information that would be helpful for a full understanding of the situation, including site and construction drawings. (Left to right) Rich Matsuda, Keck Observatory Chief of Operations (back-facing), showing Iris van der Zander, HDOH Environmental Health Specialist/Remedial Project Manager, Roger Brewer, HDOH Senior Environmental Scientist, Lauren Cruz, HDOH Environmental Health Specialist/Remedial Project Manager, and Fritz Klasner, OMKM Natural Resource Program Manager, the Keck I isolation joint where sealant will be poured to permanently contain the seepage. 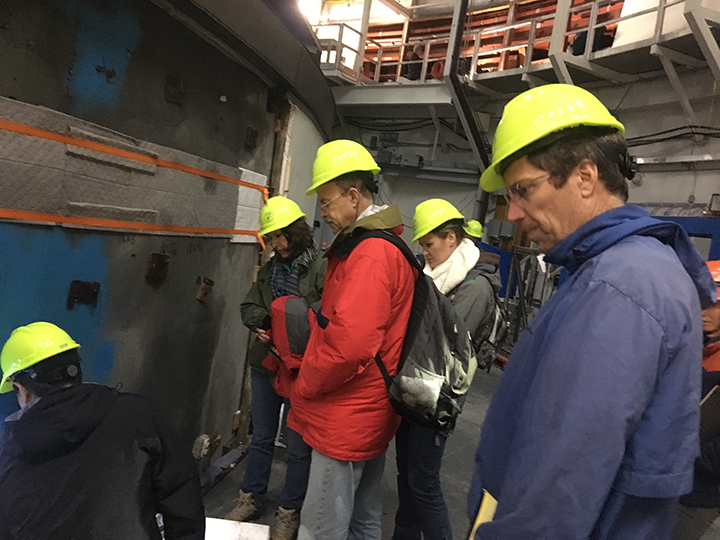 In order to give the Department of Land and Natural Resources (DLNR) and Office of Maunakea Management (OMKM) full visibility into our pier oil investigation, representatives of both organizations visited our summit facilities on Aug. 1 for an in-person site inspection. 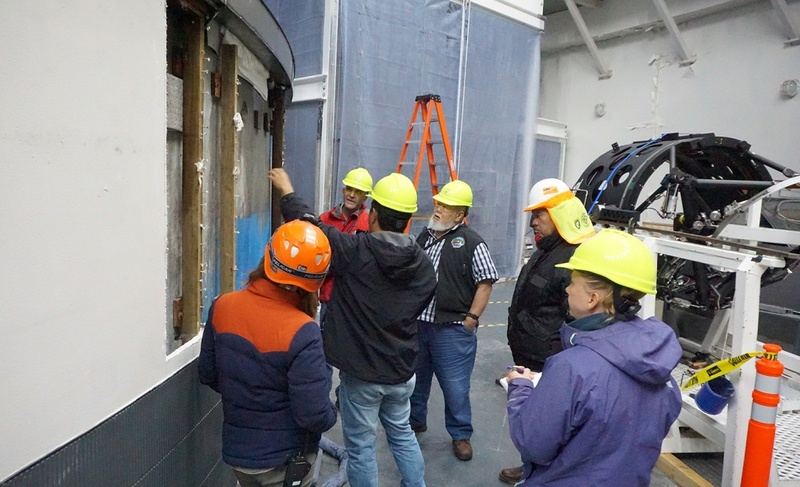 The visit was thorough, giving the oversight agencies a chance to get a first-hand look at the seepage and containment measures in place to ensure no further hydraulic fluid can reach the ground. Bob Masuda, DLNR’s First Deputy, spoke with reassurance that Keck Observatory’s ongoing efforts are on the right track. (Left to right) Erin Petrosian, Keck Observatory Environmental Health and Safety Officer (back-facing), Sam Lemmo, DLNR Office of Conservation and Coastal Lands Administrator, Rich Matsuda, Keck Observatory Chief of Operations (back-facing), Bob Masuda, DLNR First Deputy, Wallace Ishibashi, OMKM Senior Advisor/Cultural Officer, and Jessica Kirkpatrick, OMKM Resource Management Assistant, checking the progress made in containing the seepage on the Keck I pier wall. Since the formation of our internal investigation task force in May, conducting a rigorous exploration of possible releases of hydraulic fluid to the environment from our hydrostatic bearing systems (HBS) has been W. M. Keck Observatory’s top priority. On June 7, Masa Fujioka and Associates (MFA), a third-party environmental, geotechnical, and hydrogeological consulting and engineering firm that Keck Observatory hired, conducted a site reconnaissance, and we know now the full extent of the release at our facility. The investigation revealed that the total release includes a small leak coming from a hydraulic fluid return line located a few feet away from the Keck II pier; this leak was also immediately contained. We will continue executing preventative measures for all leak locations as we work with the Hawaii State Department of Health and the Office of Maunakea Management to determine next steps. MFA continues to conduct its investigation and analysis, and we are providing them with additional data needed to complete their assessment. Following an initial consultation with HDOH, and with MFA’s guidance, MFA is preparing an Environmental Hazard Evaluation (EHE) and Environmental Hazard Management Plan (EHMP) on behalf of Keck Observatory, as required by HDOH HEER office’s Technical Guidance Manual. We remain committed to working in accordance with HDOH and are giving this investigation the full attention it requires as the Observatory’s top priority.